Looks like Sylvester Stallone’s itching for more comic book movies. Currently (well, depending on where you live), the actor can be seen in Guardians of the Galaxy Vol. 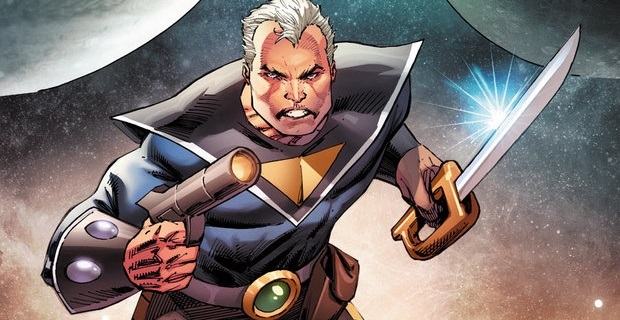 2 and now, we’re learning that he’s being eyed for an adaptation of Starlight, a six-issue series written by Mark Millar. With a script from Rogue One: A Star Wars Story scribe Gary Whitta, the project is finally starting to kick into gear after first materializing back in 2014, and while Stallone hasn’t signed on the dotted line just yet, this is definitely a promising development. If the deal goes through, the actor would be playing retired space hero Duke McQueen, who’s “called back into action one last time” after saving the universe forty years earlier. Described as both “Flash Gordon meets The Dark Knight Returns” and “Buzz Lightyear meets Unforgiven,” it’s not clear yet how far into negotiations the two parties are, but this sounds like a role that Stallone would be very well suited for and we’d love to see it come to fruition. For more on what to expect from the film, here’s the official plot synopsis of the comic, which sheds a bit more light on Mr. McQueen. The comic centers on Duke McQueen, a man who has long since settled down and left his days of saving the Universe and operating as the space hero everyone depended on—at least that’s what he thought. His wife long passed and his kids off embarking on their own adventures, Duke lives a quiet, solitary life until he receives an unexpected call from a distant world, calling him to action one last time. We’ll continue to keep you posted as this story develops, but in the meantime, tell us, would you like to see Sylvester Stallone lead the Starlight adaptation? Sound off in the usual place with your thoughts!